Lemonade Makin' Mama: Things I'm loving... and a GIVEAWAY! THIS GIVEAWAY IS NOW CLOSED AND COMMENTS ARE NOW CLOSED. I'm a little bit giddy today, about posting things I love. Okay in all fairness I'm like that a lot. But especially today!! I'm hosting one of my favorite giveaways this week... (and don't you dare scroll down to the bottom yet.) 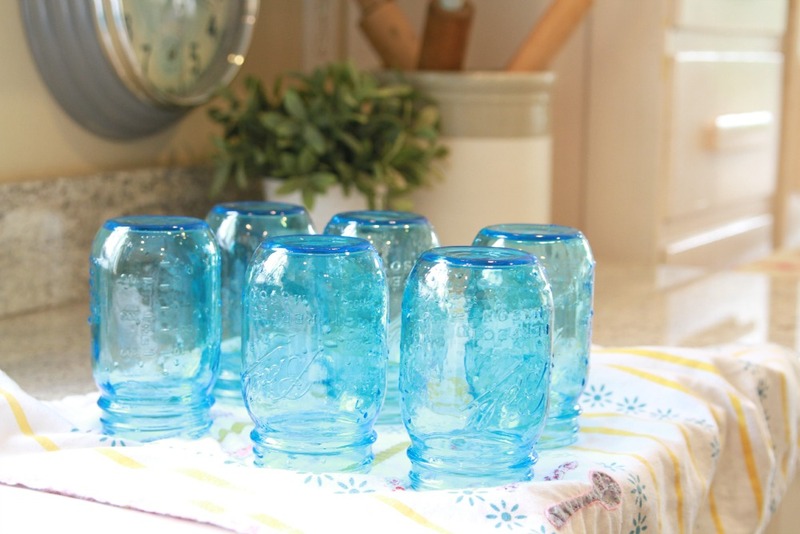 (grin) I'm loving these heritage blue ball jars that I found lurking in my grocery store. There was one box left. ONE. I nabbed it because we can always use more drinking glasses, yes? Yes!! I had a coupon for 200 free photo prints. (LOVE THAT!) I went back into my archives and realized how many photos I haven't done anything with. Like our entire Disnelyand Vacation from back in 2010. (Mom fail.) Does anyone else out there completely space it on printing out your photos? Why is that?! My hoodlums can spend hours looking through old photo albums... so I printed those suckers up and stuffed them into an inexpensive album. I love that. I know. It's really complicated. I didn't have two vertical shots that I loved, but that's okay. It doesn't have to be perfect to be tucked inside a place where nobody but you is ever really going to look at it. Then grab a glue dot. And voila! I love Joe's expression. Classic. I love having my hoodlums little faces close to my heart. I also love my customers. YOU GUYS!! I can't promise shipment in time for Mother's day depending on where you live... but I do have another batch of my antique blue ball jar flour sack dishtowels up for grabs here, if you want one. And now. For my most favorite thing.... that I love. Jessica from Jessica's Serenity is giving away a tripple wrapped bracelet to one of my precious readers. You can choose which ever one you want from her shop. Can you believe it? She is wonderful and she does gorgeous bead work. I am lucky enough to own two, but this cross absolutely has my heart and these beads are a fantastic glassy-green. I fell madly in love with it the first minute I saw it. Here is another example of her work. I love these coral beads. I do believe this is my favorite color. 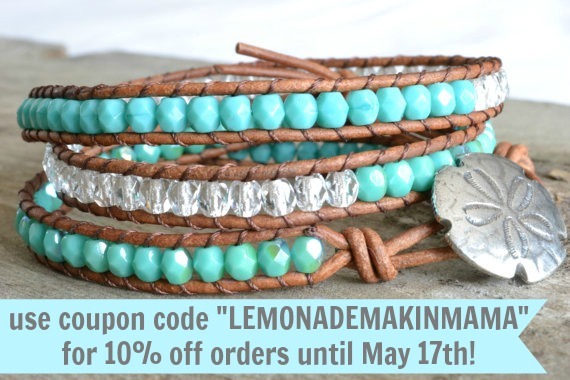 And to make it even sweeter, Jessica is offering 10% off all of your orders until May 17th if you use the coupon code "LEMONADEMAKINMAMA" when you check out. To be entered to win one of Jessica's triple wrapped bracelets... please go to her shop here, and then leave a comment for us letting us know which of her bracelets you love the most! For extra entries, Pin, Tweet, Facebook, Blog, or Instagram about it and make sure to leave a separate comment letting us know you did that, for each one! I will announce a winner next Friday! Now go forth and think about things you love all weekend. Love the idea of a locket, I always see people wearing one and think, Oh, I should get one of those, and then promptly forget again. Thanks for the reminder! I love the cross and wings bracelet. That is just gorgeous. These bracelets are all beautiful. I recently found your blog and I think it is "peaceful." I would say my favorite triple bracelet is the cross w/wings turquoise she flies w/her own wings. Thank you for this chance. I have to agree with you! I LOVE that coral -- though Jessica calls it shades of pink. Beautiful! Love them. Hard to pick my favorite. I love Cross and wings, turquoise. Country girl peachy and white with flower. And also the gypsy soul bracelets are great. Thanks for the opportunity. Also really love the blue mason jars and the origami owl locket. So cute. Thanks for sharing. Favorite posts are the best. I would love to do one of those trendy "favorites" parties for my girlfriends. Am I too old for that. Ha! I really love the Surfer Girl! My favorites are the all black or charcoal gray ones with the turquoise ones coming in second and the white ones coming in third...they are all really amazing....and I didn't know Origami Owl did lockets! Love your locket. I love all the bracelets but if I had to choose I'd pick A Gypsy's Soul with shades of pink and clear. Cross and Wings 'she flies with her own wing's turquoise!! Love it!!! They are all stunning!!!! I love those bracelets! So pretty!!!!! I so want those blue jars! I need to look before they are all out! I'm in love with the Cross and wings 'she flies with her own wings', turquoise...I love love love turquoise and i love the distressed cross. Hard to choose but I love gypsy soul!! Oh, and I went over and liked her on facebook. Cuz I do. A lot. <3 Thanks for introducing us. I love Sunshine, bohemian friendship bracelet in yellow. They are all so pretty though it was hard to choose! I like the flies with her own wings bracelet, so pretty. Thank you for hosting this giveaway and those jars, you lucky lady! I've never seen the blue jars, but I love them. And, that turquoise bracelet, I'm just sure it has my name on it. :o) Happy weekend! gotta get one for sure! also, that jewelry is fab. the coral bracelet is amazing! 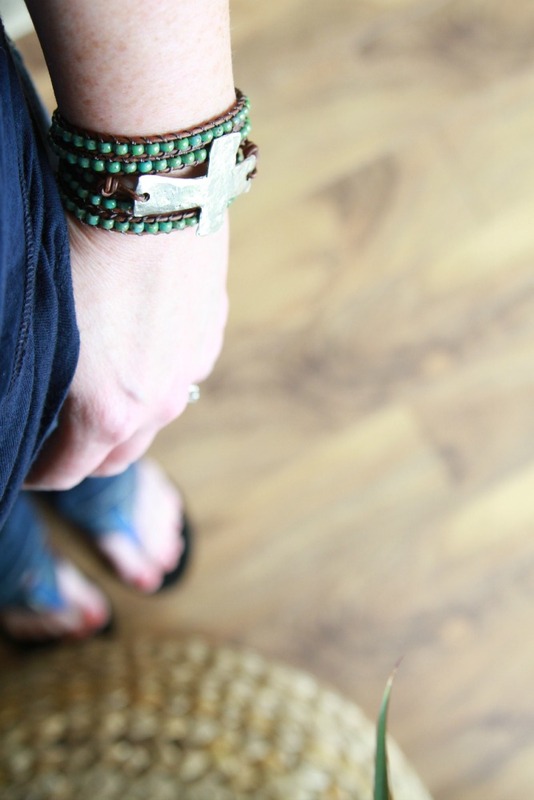 I adore the gypsy soul aqua/mint butterfly wrap bracelet! I love the A gypsy's soul, Aqua/Mint Butterfly wrap bracelet. I love butterflies so I was immediatly drawn to this one. I also like the cross wrap bracelets are well. So many cute things! A gypsy's soul in turquoise and clear is so pretty! Love the beads and leather combination! I love the Rustic Girl beaded cuffs and the Gypsy coral beaded cuff. I love the idea of the picture inside the locket. And the locket you have is beautiful! I love the cross and wings and the coral wrap. All are so beautiful! The cross one is definitely my favorite, but I also love the one with the 2 flowers entitled "A gypsy's soul, turquoise beaded, brown leather triple wrap bracelet, Rustic Country, Gypsy, Boho chic, bohemian, Chan Luu style". I love the cross and wings turquoise bracelet! Thanks for the giveaway!! i love the one on your wrist the best, cross and wings. well, i'll have my finger's crossed pretty tight, since i'm just sure my husband isn't going to approve me buying an $85 bracelet!! these are so gorgeous!! Definitely the cross and wings one... SOOOO AMAZING! The cross wrap bracelets are beautiful. It's tough to decide which one! I like the purple one with flowers but I also like the sideways cross. Tough choices! Love the cross "she flies with her own wings " with either turquoise or charcoal beads. Gorgeous. I love whatever you love, I'm pretty sure :) great idea for the lockets...sophie just got one for her bday and it took me forever to print out a little tiny picture. blue mason jars = love... such a cute locket and that's a great idea for picture sizing... just placed my order for a mason jar dish towel and am pretty excited about it... and thanks for the chance at this giveaway... just visited the shop and there are so many pretty bracelets to choose from... i especially love A gypsy's soul, Aqua/Mint Butterfly, leather triple wrap bracelet! I love the Cross and Wings turquoise and any of the the Gypsy Soul. So fun!! I'm pretty sure this is a trick question because all Jessica's pieces are so pretty! I do really love the beaded cuffs...and the cross and wings is gorgeous...oh, and the coral/pink mix wrap is lovely. See what I mean? I like the "Cross and wings" turquoise bracelet too! I love looking at your photos. They are always filled with such glorious light! I like the "gypsy's soul turquoise", my new favorite color. What a gorgeous store she has! If I had to pick I would pick her, Cross and wings 'she flies with her own wings'. But, it is hard to pick! Thank you for the chance to win. Also, Sasha where do you buy your groceries? I want those jars! Cross and Wings, Cross and WIngs!! LOVE!! My favorite is the 5 time wrap charcoal beaded sideways cross bracelet. Beautiful! I shared on Facebook. Do you mind my asking what grocery store you found the blue mason jar? I love all her jewelry and had a really hard time picking just one so my favs are gyspy soul shades of aqua and the sideways cross fleur de lis. I shared on pinterest http://pinterest.com/pin/63050463505786566/. Love the sideways cross fleur de lis, but really they're all lovely. thanks for the giveaway! And on my facebook https://www.facebook.com/pages/The-Open-Window/123854907697820. I love the turquoise and cross bracelet you are wearing! Thanks for a great giveaway! And pinned even though I avoid Pinterest at all cost. Too dangerous. I'm crushing on the cross with the turquoise beads. Love! Love anything purple.....the Gypsy Soul in purple is awesome. I like the "A gypsy's soul, shades of aqua and clear beaded" and "Coral beaded, Brown leather triple wrap bracelet." So fun! Love the Cross and Wings 'she flies with her own wing's turquoise!! I love the cross just like you have... beautiful! A gypsy's soul, turquoise beaded bracelet is my favorite. you're amazing, you. you work so hard to help provide for your family. may He continue to bless all you do. i love the mint butterfly gypsy bracelet! I adore a gypsy's soul! I would choose any one of the crosses. So pretty! How to decide on one favorite...they are all fantastic and so pretty. I have to say the aqua butterfly is my favorite one though! Makes me think of spring! So many to choose from! I love the coral wrap one, or the turquoise wrap with the sand dollar. All so lovely! Rustic country girl cuff is my favorite!!! Such beautiful bracelets. Love your blue mason jars, too! I love the coral beaded bracelet with the heart...swoon! I loved the Purple beaded, Brown leather triple wrap bracelet, Rustic Country, Gypsy, Boho chic, bohemian, Chan Luu style. Loved the blue mason jars!! Any of the Surfer Girl bracelets!! So darling! Great giveaway. EEEEeeeek! I love the Cross and Wings one! I must have the cross bracelet....love it!! Love the cross and wings! So love the coral colored beaded one!! They are all so beautiful I would totally have a hard time picking but that one definitely caught my eye!! I got my mason jar kitchen towel in the mail and I LOVE IT!! Also, scored a couple of your pix from etsy and they are just so darn cute!! Thanks girl!! They are so pretty! The coral is my favorite. I love the side cross with the charcoal beads. So pretty! Love the cross and wings with the turquoise beads. her stuff is so great. Aqua beaded, Brown leather triple wrap bracelet, Rustic Country, Gypsy, Boho chic, bohemian, Chan Luu style is my favorite as is the one above with the clear beads and sand dollar. I would be proud to wear it all summer! my favorite is Cross and Wings "she flies with her own wings" clear. SO pretty! all of them! Love the coral colored or the mint with the butterfly. Adorable! I'm liking the little aqua sideways cross. Simply beautiful. I love this one: Purple beaded, Brown leather triple wrap bracelet, Rustic Country, Gypsy, Boho chic, bohemian, Chan Luu style. And this is actually only one bracelet! It looks like more, but I copied and pasted her description! Loving the A gypsy's soul, coral beaded, brown leather triple wrap bracelet, Rustic Country, Gypsy, Boho chic, bohemian, Chan Luu style ~ phew ~ thank goodness for cut and paste!! I like the sideways cross in Aqua. So cute. Cross and wings in turquoise and brown. Gorgeous work! They are all beautiful, but I would pick Sideways Cross fleur de lis. Thank you so much for the awesome giveaway! Really love the Sideways Cross 'fleur de lis'. So cute!! Love and blessings my friend. I love the bracelet just like the one you have on!! I LOVE the one you are wearing. I must order one now! Wow! I'm not sure it's possible to pick a favorite...they're all incredible!! I guess I'd have to pick the gypsy mint/ butterflies one. Cute!! The cross and wings bracelet.....turquoise beads....is awesome!! Thanks for the chance!! LOVE her stuff! I love the country girl beaded cuff. I love the Country girl beaded cuff bracelet. It's hard to choose one favorite though! I just pinned the surfer girl beaded cuff bracelet, just love it! It is so hard to choose but I would say surfer girl and country girl are my favorite!! Aqua/Mint beaded, hand knotted, leather, bohemian chic, rustic country surfer chic is my favorite bracelet. There are a lot of cute ones! A gypsy's soul, coral beaded, brown leather triple wrap bracelet. So many beautiful bracelets. Thanks for the chance to win! LOVE the ball jars! The turquoise ones are a constant in our house during the spring/summer. They're super versatile! Cross and wings 'she flies with her own wings', clear, distressed brown leather 5x wrap bracelet, Rustic Country-Boho chic is my FAVORITE bracelet! :) What fun. Thanks for the opportunity to enter the contest! I love this! Cross and wings 'she flies with her own wings', turquoise, distressed brown leather 5x wrap bracelet. Thank you for the giveaway! I love her cross and wings bracelet!!! She is super talented and so are you!! The dishtowels are beautiful! CROSS AND WINGS LOVE IT. yOU PRINT ALL YOUR THINGS ON YOUR HOME PRINTER? SILK SCREEN? I love the surfer girl cuffs! The wing earrings are pretty too. She does beautiful work! I love the purple beaded triple wrap bracelet with the flower. They are all so unique and beautiful! The cross and wings bracelet...swoon!!! Such beautiful pieces. I love the Cross and Wings bracelet, but also the simpler Sideways Cross. SO pretty. Love a gypsy soul in turquoise! These are gorgeous! Also love those blue ball jars...and the locket-precious! All so swoonable! Oh my goodness...the cross bracelet is lovely!!! So much cuteness! Aren't those blue jars the best? I have an old one and must go find new ones to give as gifts. It would be so much fun to cut flowers out of my yard and share with friends in a pretty blue jar. I just went and looked at the gorgeous jewelry. The one I'd definitely pick is Pearly white beaded, black leather triple wrap bracelet. I love the gypsy's soul, shades of aqua and clear beaded, leather triple wrap bracelet! Thanks! I love the gypsy's soul shades of pink. It's so georgeous! I totally love the Cross and Wings She Flies With. What gorgeous bracelets she makes!!! Thanks for sharing and for the chance to win! I love the bracelet you are wearing in the pic. I think it is the Cross and Wings bracelet. Absolutely beautiful and I need this for my summer outfits. ;-) Thanks for the chance. Well, I love them ALL! But if I had the choice of one... I would go with the cross and wings bracelet . Perfection on my wrist! Decisions, decisions! They are all beautiful! What a talent! They are all very pretty...my choice would have to be the Turquoise Mermaid...that would be lovely. Thanks for sharing and for the chance to win. I really liked the gypsy's soul, coral beaded, brown leather triple wrap bracelet. I love the "gypsy soul" with coral beads! Lovin all your favorite things too! I love that rustic country girl beaded bracelet in aqua & pearl white. In fact, I love a lot of them. Fun giveaway! I have not seen jars like this so cute! 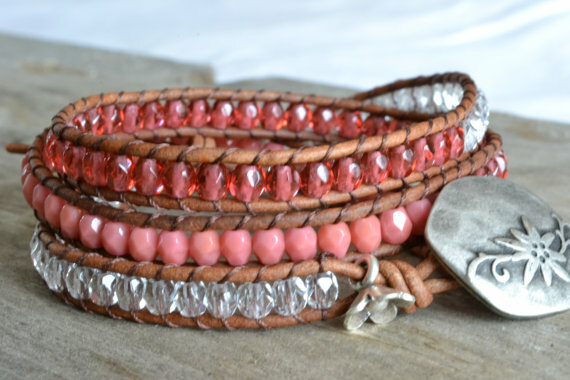 I love the coral beaded brown leather with the heart! Oh my! My favorite is the Gypsy's Soul turquoise beaded! What a sweet piece of jewelry! Love love the turquoise triple cross bracelet, so cute!